It’s not very often I get to catch up on the news. So whilst on the train this morning, I did just that. When I saw, on my Sky News App, a story about a member of NHS Management, who is paid £175k a year, who has done a motivational video for staff. I’ve yet to watch the video (poor signal, thanks to moving train) but already I think it’s great. 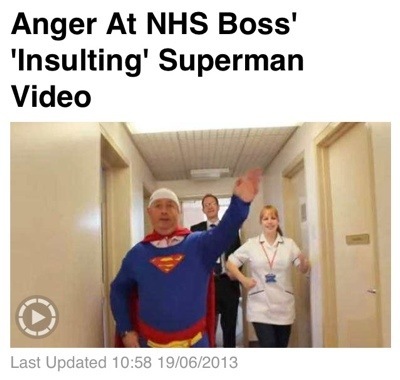 A manager dressed up as superman dancing about the place to encourage staff to exercise. The NHS goes on about the rising rate of morbidly obese people, and the amount it costs the NHS when they have to fund treatments, give advice, and so on so forth, for obesity related health conditions. So one Trust is doing something to promote fitness at work, good on them! I get it that hospitals are busy places an most staff don’t have time to fart much less take a lunch break, but it’s a good idea. The whole practice what you preach phrase springs to mind! When I was pregnant with Emma, I weighed a huge 92.1kg, the consultant I was referred to (because of my weight, BMI and history of depression) was twice my size. She wrote down my BMI, pushed a leaflet across the desk to me about pregnancy and weight gain and didn’t utter a single word about my weight or BMI. Funnily enough when she wrote to me an my GP about our appointment she had the cheek to say “we discussed nutrition during pregnancy”. Ha! Liar Liar pants of fire is another phrase that sprang to mind! My point is, the NHS are start starting to practice what they’re preaching to their staff. Good on them! That’s not strictly true is it? On the basis that the video was made during working hours and breaks are paid breaks? Did it *really* not cost the Trust any money? I doubt it, but whatever it did cost, I think it was well worth spending! What’s your opinions on this story?